From left, Rep. Todd Stephens, Village Tavern Owner Theresa Modestine, Dylan Butterworth, Horsham Little League Volunteer Amy Butterworth, and Alison Valone. HARRISBURG—Rep. Todd Stephens (R-Montgomery) recognized Theresa Modestine, owner of the Village Tavern in Montgomeryville, for donating a heart defibrillator to the Horsham Little League. In May, with Stephens’ backing, Gov. Tom Corbett signed Act 59, which requires coaches to be trained in sudden cardiac arrest so they can learn the symptoms. More than 7,000 young lives are claimed by sudden cardiac arrest each year. Members of the Horsham Little League approached Stephens in the spring for assistance in obtaining funding for a defibrillator. 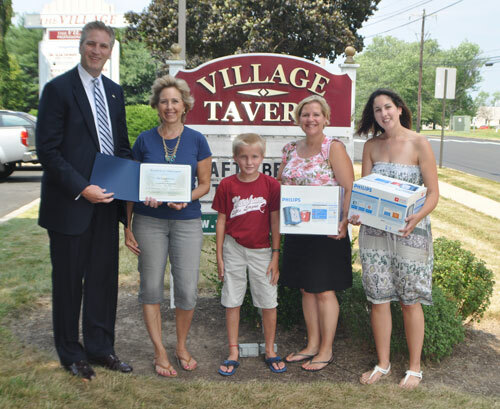 The Village Tavern organizes a 5K run annually to purchase defibrillators for local organizations. When Stephens learned of this, he asked the Village Tavern to consider the Horsham Little League as a recipient of one of the defibrillators. Amy Butterworth, a volunteer with the Horsham Little League and mother of a young ballplayer, accepted the defibrillator for the organization. “On behalf of the Horsham Little League, we want to thank the Village Tavern. We’re looking forward to having these important devices on our fields to assist any child who may unexpectedly suffer from sudden cardiac arrest,” said Butterworth.